Currently all commercial vaccines are indicated for intramuscular administration. However, few of them are also indicated to inject by intradermal route. Compared to conventional intramuscular administration, intradermal injection in pigs are usually carried out using needle-free jet injectors. Less invasive: reduce the pain and stress to pigs. Lower risk of iatrogenic transmission. Increase the uniformity of the dosage administered to the herd. 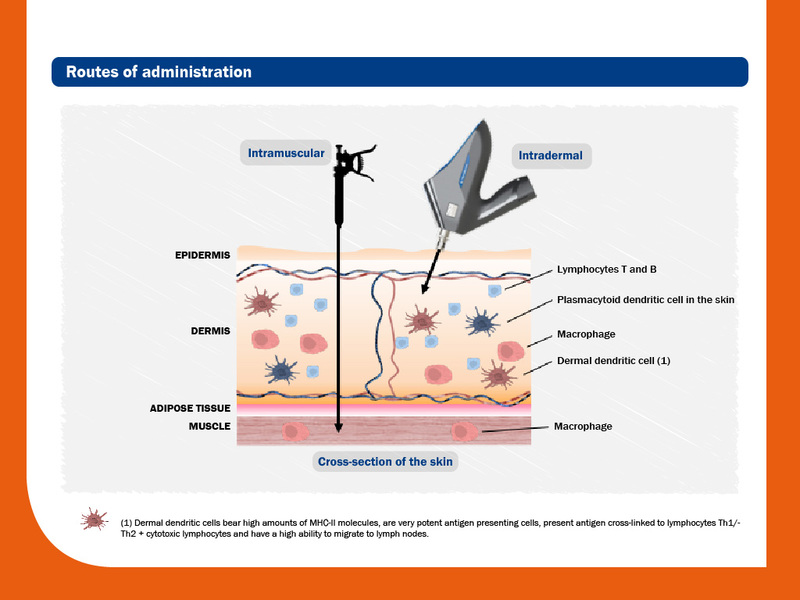 Dermis is a tissue rich in immune cells: comparable immune responses or even higher. Slow and gradual local absorption: more time to capture the antigen. As it can be seen in the graph, skin contains a high concentration of immune cells, among them dendritic cells -resident or recruited from the blood stream-, and lymphocytes B and T.
Therefore, this placement is particularly rich in antigen-presenting cells, being an ideal location for injection. Active transport: stimulation of resident dendritic cells in the dermis and migration to lymph nodes. Passive transport: activation of resident dendritic cells in lymph nodes by antigen passive arrival. Some studies have been specifically designed to compare immune responses between these two routes of administration. Total antibodies measured by ELISA seem similar; however, the intradermal administration can confer higher levels of cell-mediated immune response than the intramuscular route. It is important to note that results should not be extrapolated to other vaccines. In vitro studies have demonstrated that different strains have variable effects on the expression of immunologically relevant cell-surface molecules and cytokine production in dendritic cells. 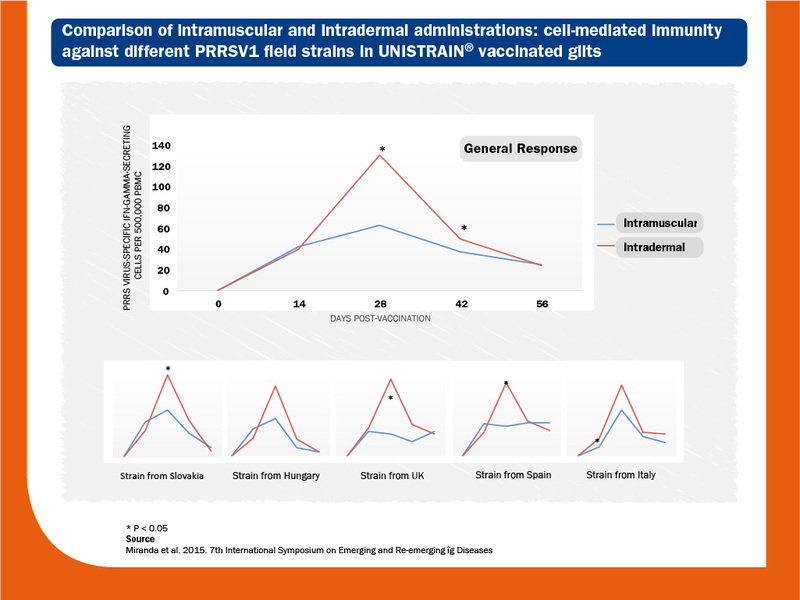 As dermis is rich in dendritic cells, immune responses and efficacy after intradermal administration should be assessed for each vaccine strain.